Garden railroading is arguably the fastest growing segment of model railroading, and a rapidly growing segment of gardening/landscaping as well. Sometimes I think we "old-timers" lose sight of how many newcomers there are in the hobby at any given time, or of how much new information they have to absorb to be on anything like a level "playing field" with the rest of us. Within a very few years, an entire "subculture" has emerged, speaking in obscure terms that would lead outsiders to believe that some of us count every rivet on our cars while others walk around with rulers ten feet long. I also don't want to clutter the list with terms you might find in a gardening reference (like Ph or "acid-loving"). Consider this list mostly a compilation of those usages which make the Garden Railroad/Large Scale community unique, quirky, and in some cases, a little feisty. If you have a term that you think fits that description, please e-Mail me the term, and a definition, if you want. Accucraft - A manufacturer which has often released high-quality limited-edition Large Scale steam locomotives. Accucraft has recently released some plastic rolling stock that is of comparable quality to their locomotives, and is priced very reasonably, considering the quality. Alps Printer - The Alps company made a relatively inexpensive printer that printed waterproof colors. Many Garden Railroaders picked them up when they were being closed out and have used them for printing signs and decals. Unfortunately, Alps no longer sells these printers in the United States, but the ribbons still seem to be available. A few Alps owners, like incurable tinkerer J. W. Rosenbauer, have "cottage industries" based on designing custom color logos and printing them on decal stock for people. You don't have to own an Alps printer to be a Garden Railroader, but you might want to make friends with someone who does. American - help early steam engines navigate rough track, American locomotive designers put a four-wheel pilot truck on the front of their locomotives, which, like their British predecessors, tended to have only four drivers. Then the American designers, realizing that they could extend the boiler far forward without significantly losing traction, began to capitalize on the new design. Consequently the "American" locomotive (four pilot wheels, four drivers, and no trailing wheels) dominated the American railroad landscape for the second half of the nineteenth century. The earliest "Atlantic" and "Ten-wheeler" designs were largely attempts to carry the success of the American design into a larger format. Both Bachmann and Hartland Locomotive Works make American-style locomotives suitable for use in late-19th-century Large Scale railroads. Annie - A nickname give to a special ten-year anniversary edition of Bachmann's ten-wheeler locomotive. Annie had more metal parts and better engineering over all than the previous version of the product and was priced very reasonably. Atlantic - A locomotive with four pilot wheels, four drivers, and two trailing wheels. The earliest Atlantics were largely an effort to give the earlier designed "American" locomotives bigger boilers and fireboxes. Later attempts, such as the popular Pennsylvania E6, fine-tuned the Atlantic into a high-speed passenger engine without rival in its class. The only Atlantic that has been mass-produced in Large Scale was an "adaption" of the PRR E6 that was made by Lionel for several years before they left the Large Scale marketplace. With a little "tweaking" that locomotive can be quite useful if you come across one. AristoCraft - A line of Large Scale model trains and accessories manufactured by the Polk family, who owns a hobby supply business in New Jersey. Most AristoCraft trains are about 1:29 in scale, though the "Classics" line (and, reputedly, their 2-4-2 Rogers locomotive) are 1:24. AristoCraft also offers a wide variety of power and control devices and many different track products. Bachmann - A toy and hobby supply manufacturer which supports many non-Large-Scale gauges and scales as well as Large Scale trains. Bachmann manufactures a wide range of low-cost 1:22.5 equipment including a Ten-Wheeler, which is their most popular 1:22.5 locomotive. Bachmann has also recently released a line of high-quality 1:20.3 industrial and 19th-century locomotives. Barry's Big Trains (BBT) - A supplier of drive mechanisms for Large Scale. Barry manufactures custom Gauge 1 locomotive drives. He also replaces the drive mechanisms of Bachmann Ten-Wheelers (4-6-0s) with much improved mechanisms. He even makes a kit to convert the Ten-Wheeler to a Consolidation (2-8-0). Barry advertises in Garden Railways and Finescale Railroader magazines. Big-Trains - This is a "generic" term that folks have used to include anything larger than HO. For example, the Walthers' "Big Trains" catalog lists equipment for S Scale (1:64), O Scale (1:48), and G Scale (see below). On the other hand, if you join a "Big Trains" mailing list or similar forum, you may be disappointed to find that the vast majority of its members use trains that run on 45mm track. By definition, Big Trains includes many kinds of hobbyists, including Fine Scalers, Live Steamers, Collectors, Model Railroaders, Garden Railroaders, and Large Scalers. Many Collectors have Garden or Model Railroads as well, but, by default, they tend to focus on equipment by a few manufacturers, usually including LGB. Connie - A nickname given to Bachmann's outside-frame Consolidation by Narrow Gauge fans. Consolidation - A steam locomotive with a 2-8-0 wheel arrangement (one pair of pilot wheels and four pairs of drivers). Consolidations were popular motive power in the late 1800s and they remained in use on narrow gauge lines well into the early 1900s. This makes them an excellent prototype for Narrow Gauge modelers. The most famous Large Scale Consolidation is the Delton 1:24 model, which has been remanufactured by AristoCraft in both coal and wood-burning versions. In 2001, the Bachmann company released an "outside-frame" consolidation. It will be a 1:20.3 model, but the prototype is so "dinky" it shouldn't dwarf Bachmann's 1:22.5 cars. Arguably the largest Large Scale consolidations you're likely to see on Large Scale railroads for the forseeable future are Bachman 1:22.5 Ten-Wheelers (4-6-0s) that have been retrofitted with 2-8-0 mechanisms from Barry's Big Trains. Delton Locomotive Works - An early Large Scale equipment manufacturer which manufactured several high-quality brass locomotives and a line of quality 1:24 US-Narrow-Gauge-style plastic trains. Their most famous locomotive power were a Consolidation (2-8-0) and the "Delton Doozie," a railbus. When Delton went under, Aristocraft bought many of the molds, reengineered the 2-8-0 and remarketed the line as their "Classics" line. AristoCraft did not pick up the Delton molds for the "Doozie" or the passenger cars, but Hartland Locomotive Works has some products that look very familiar. Diameter - The way Large Scalers refer to curves in their track, a practice inherited from most of the Large Scale manufacturers. When a Large Scaler tells you he is using mostly five-foot curves, he may well mean 30"-radius curves. Don't blame him for confusing you; it's not his fault. See "Radius." Dwarf Alberta Spruce - A short-needled, easily shaped, slow-growing evergreen often used by Garden Railroaders to represent upright trees. Though the label says they can reach sixteen feet in height, they grow very slowly unless you overwater or overfertilize them. I have yet to trim any of my 2-4-year-old trees for height reasons, although one may need trimming this year. Fine Scale - A Fine Scaler is a model builder who focuses on exactness of proportion and detail. There are Fine Scalers in Large Scale who don't even run trains, they just like the opportunity for adding an infinite level of detail that Large Scale offers. And some of them create jaw-dropping products. There are Fine Scalers in other scales, of course. There are also Fine Scalers who do operate Model or Garden Railroads. However a typical Fine Scale garden railroad would tend to have a few, very nicely crafted pieces, rather than a yard full of off-the-shelf or slightly modified trains [like mine--Paul]. As a rule, calling a true Fine Scaler a "Rivet Counter" misses the mark, as it's an understatement. Fine Scale Railroader - A magazine that caters to Fine Scalers of all scales. It does tend to have more articles about Big Trains than most model railroading magazines, though, as well as a number of tips and tricks Large Scalers can use. Flex-Track - Track that does not use preformed curves. Usually the pieces are 6' long, and the tie plates are fastened loosely, so you can bend the track slightly without any special tools. However, for curves less than, say 20'-diameter, you might want to borrow a rail-bender, slide the ties off, bend the rails to the desired curve, then slide the ties back on. While newcomers are sometimes a little afraid of this process, flex track allows for more realistic easements and curves than "sectional-track." The longer rails also conduct electricity better than several short pieces of track fastened together. Garden Railroading - Operating toy or model trains outside, usually in a landscaped setting. Although Garden Railroading has been a hobby in Europe for over a century, most North American Garden Railroaders got their "start" after LGB equipment was introduced into the continent. Consequently most US Garden Railroaders use equipment that is at least somewhat compatible with LGB, although that is by no means a requirement. Typical Garden Railroaders also learn at least a little about ponds and about dwarf and miniature trees and plants so they can create an agreeable natural setting for their trains. Garden Railways - A magazine that promotes Garden Railroading with articles, product reviews, and advertisements. A must for the beginning garden railroader, useful for anyone in the hobby. The distance between the rails on the model track (measured from inside edge to inside edge). For example, the rails on S gauge track are 7/8" apart, and the rails on Gauge One track are 1.775" (45mm) apart. The distance between the rails on the track being modeled. For example, "real-world" standard gauge trains (like the mainlines in the US) use track that is 56.5" apart, and "real-world" narrow gauge trains use smaller distances, like 24", 36", one meter, and 42" . Some of the scale and gauge confusion in Large Scale/Garden Railroading equipment comes from the fact that people are using the same 45mm track to model all kinds of real-world trains. The Family Garden Trains article "Which Scale Should I Model?" describes the reasons for some of these situations. Gauge One (also, #1 Gauge) - Model railroad track with 45mm between the rails. This is the name that was originally given to this sort of track over a hundred years ago by German Toy Train manufacturers. With the advent of LGB trains, there has been a tendancy to call 45mm track "G-Gauge." But several manufacturers who make trains in different scales from LGB's (1:22.5) scale, have lately taken to calling this track by its earlier name of "Gauge One" (or #1 Gauge). G Gauge - According to Marc Horovitz, the hardworking editor of Garden Railways magazine, there is no such thing. Technically speaking, 45mm track is "Gauge One," so named by German toy train manufacturers over a hundred years ago. However (to Marc's frustration) many hobbyists and clubs (and a few manufacturers) still use the phrase "G Gauge" to refer to model railroad track with rails 45mm (about 1 3/4") apart. To make things really confusing, many different kinds and scales of trains are running on 45mm track these days, so just saying, "G Gauge" or "Gauge One" or even 45mm doesn't necessarily give you enough information about what's actually running on that track. You also have to look at the "Scale" of the equipment. G Scale - This scale refers to equipment that has a 1:22.5 relationship to the "real world." LGB "invented" G Scale when they used 45mm (Gauge One) track to represent 1-meter real-world track. Garden Railroading/Large Scale equipment choices get wierd because other manufacturers use 45mm track to represent other real-world track gauges, including 36" and 56.5". (These represent 1:20.3 and 1:32 ratios respectively). See the Family Garden Trains article "Which Scale Should I Model?" for a comprehensive discussion of how we got into this fix. The short version is that the phrase "G Scale," properly used, refers to 1:22.5 equipment, generally running on 45mm track. By definition, trains in other scales, like 1:20.3, 1:29, and 1:32, are not G scale, however often you hear them referred to that way. And unfortunately, the label "Compatible with all G Scale trains" on a box usually means only that you won't touch off a matter-anti-matter reaction if you put the contents next to the trains you already own. Hartford Products - A supplier of craftsman-style kits for US Large Scalers, specializing in Narrow Gauge equipment. Hartland Locomotive Works - of US Narrow-Gauge equipment that is generally about 1:24 in scale. Motive power includes industrial and 19th-century equipment and a railbus similar to the (now-extinct) Delton Doozie. HLW has also introduced several nice traction models, which, unlike the Bachmann trolleys, will not overwhelm your trains). I am told that Hartland's new line of products may be closer to 1:20.3, which would make them far more compatible with the new Bachmann equipment. Hi-Rail - Trains which are more-or-less scale models, but use flanges that are too wide, requiring track that is "too tall." This usage was coined by people who built Model Railroads with trains like American Flyer's S gauge trains, which were generally scale in every respect but flanges and couplers. The term has also been applied to some three-rail O-gauge railroads that use ill-proportioned trains that, frankly, aren't anywhere near the "right scale" for the track they run on (some are as much as 40% shorter than they "ought to be"). So, in some "Rivet-Counter" circles, the term "Hi-Rail" has aquired a negative connotation that means "bordering on Tinplate." Hn3.5 - the NMRA's name for 1:24 trains on 45mm track. This is actually about the "right" scale for modeling 42" narrow gauge railroads (of which there WERE a few) on 45mm track. Initially, Delton Locomotive Works line chose this scale because so many accessories were available (1:24 is a popular dollhouse scale.) Few manufacturers are supporting this scale now, though. The Delton Locomotive products that have been reissued by Hartland Locomotive Works and the AristoCraft Classic line are about 1:24. Hudson - A locomotive with four pilot wheels, six drivers, and four trailing wheels. This was the high-speed passenger locomotive of choice for New York Central and several affiliates during the "golden age" of steam. As a result, NYC Hudsons have always been popular in the smaller gauges. In fact, for many decades, Lionel gave their small, toy locomotives a shape that made them resemble NYC Hudsons from the top. When MTH moved into Large Scale, the NYC Hudson was one of the first locomotives they announced. It is a nicely-made, reasonably-priced plastic 1:32 model with a very good sound system built in. Before MTH made coaches, many hobbyists used these to pull AristoCraft heavyweight passenger cars; even though the model was 10% smaller in scale than the coaches, the engine was big enough to look great in front of them. Later, USA Trains announce that they were also building a Hudson model, a 1:29 diecast metal monster that would just about pull you around the back yard if you could fit onto a Large Scale car. Needless to say, the USA Trains model costs more. Jean's Dilly - A smaller, shorter-needled version of Dwarf Alberta Spruce that seems to retain a vertical shape better than Dwarf Alberta, which can easily become bushy. Kit-Bashing - Reworking any commercially available model into a form other than what the manufacturer intended. A simple example might be changing one diesel model into another one by changing the fan housing and power trucks, etc. A more complex model might be building an 0-6-6-0 by linking the chasses of two 0-6-0s and lengthening the boiler of a 4-6-2. Kit-Bashers also bash cars, buildings, vehicles, and other accessories. Because relatively few prototypes have been modeled in Large Scale, Large Scale may include a higher proportion of Kit-Bashers than O, HO, or N. One breed of Kit-Basher that may almost be peculiar to Large Scale is the basher who "converts" a model built for one scale to a model for another scale. For example, Bart Salmons has converted a 1:20.3 Bachmann Shay to use on his 2'-gauge 1:13.5 "industrial" railroad by replacing the cab and smokestack and making numerous other changes. Large Scale - Some time after the introduction of LGB, it became common to call anything that ran on 45mm track "G Scale," no matter what relationship the model bore to real life (see "G Scale"). Hobbyists looking for terminology more specific than "Big Trains" and less specific than "G Scale" settled on "Large Scale." Jon Dekeles, creator of a popular Large Scale web resource, was instrumental in popularizing this term for general use by 45mm users (as well as getting manufacturers to post the Scale of their products). Today, "Large Scale" typically refers to anything that runs on 45mm track, so it includes "G Scale" and many other scales besides. Most US Garden Railroaders are also Large Scalers, but the two groups are by no means identical--some fine outdoor layouts use other gauges of track, and some fine indoor layouts use Large Scale equipment. By definition, Large Scalers include many kinds of hobbyists, including Garden Railroaders, Model Railroaders, Collectors, and Fine Scalers. Layout - An operating Model Railroad. This term is more common in smaller scales where table-top railroads are more common. Still, it seems that for most Garden Railroaders, there is more to "laying out" track outside than inside. Many Garden Railroaders prefer the term "railroad" to the term "layout," because they feel their railroad is "real," if diminuitive. After all, Garden Railroaders put up with many of the obstacles that the 1:1 railroads do. (Some folks have even built up enough confidence building 45mm railroads that they have moved up to 2' and larger railroads.) Still, folks who've moved up from the "indoor" scales have been known to drop the "L" word into conversation, and we try not to take offense. Lehmann - Ernst Paul Lehmann Patentwerk, the German toy company that introduced LGB brand trains in 1968. Lehmann also makes Lehmann ToyTrain brand trains (which are compatible with LGB trains) and a variety of toys under brand names including GNOMY(tm) and RIGI(tm). LGB (Lehmann Gross-Bahn ) - brand name for G-Scale trains produced by Ernst Paul Lehmann Patentwerk. "Lehmann Gross Bahn" means "Lehmann's Big Train." Early LGB offerings consisted of German Narrow-Gauge (1-meter) prototypes. LGB equipment is more-or-less 1:22.5 scale, with adjustments necessary to negotiate tight "1100" curves and with larger flanges for trouble-free operation outside. The diminutive Stainz steam locomotive was so ubuquitous in the early days that it became part of the LGB logo. When LGB began making US-prototype Narrow-Gauge equipment, they kept using 1:22.5 scale. The LGB Mogul (2-6-0) is the hallmark of their US-prototype line. Note: LGB is a brand name and a registered trademark of Ernst Paul Lehmann Patentwerk. Not all G-scale trains are LGB, and "LGB" is not a generic name for products that run on 45mm track. Lionel - A manufacturer of O-gauge Tinplate and Hi-Rail equipment which has intermittently manufactured equipment for Large Scale. Lionel doesn't advertise a scale for its equipment, but much of Lionel's earliest "Large Scale" equipment seemed to be about 1:24 in height and 1:32 in length. Currently, the only new Large Scale trains with the Lionel label are a Christmas set that is mechanically sound but not exactly realistic and several cheap battery-powered toy sets that are way undersized and not suitable for any serious use. The 1980's- era Lionel 4-4-2 Atlantic and 0-6-0 old-timey locomotives were both fairly well made and fairly attractive, though, so if you come across one for a reasonable price, don't be too afraid of it. Many of those old Atlantics are still running. Live Steam - A Live Steam locomotive uses real steam to power its cylinders. Live Steam model locomotives have been around for many years, but they got a recent boost when G scale and modern Garden Railroading came along. Many an innocent Garden Railroader has inadvertently been drawn in to this world of burnt fingers and real cinders by accepting an invitation to operate a friend's live steam engine at a visit or open house. Don't be fooled, Live Steam is not exactly Garden Railroading, even though you generally do it outside. It's another hobby altogether, with its own rules and lingo, and a downright addictive one at that, as a number of "former" Garden Railroaders can attest. You can see the signs of addiction, as their lovingly-assembled buildings go unmaintained, figures fall over and stay there, and a fine coat of oil and ash covers everything (and eventually everybody) in sight. There is no known cure. There are now many relatively inexpensive ways to get your "toes wet" in Live Steam; even the least expensive models can be retrofitted with attractive details, remote control, and electronic bells and whistles to increase your enjoyment. But don't say I didn't warn you. LS/20.3 - 1:20.3 trains on 45mm track. Used primarily to model 36" Narrow Gauge prototype, including Bachmann's recent line of industrial and 19th-century locomotives and recent Accucraft mainline Narrow Gauge prototypes. See 1:20.3. LS/22.5 - 1:22.5 trains on 45mm track. Originally adopted to model 1-meter Narrow Gauge prototypes, also used by LGB and Bachmann for 36" US Narrow Gauge mainline prototype. See 1:22.5. LS/24 - 1:24 trains on 45mm track. Used primarily for 42" Narrow Gauge prototypes, also used by Hartland Locomotive Worls and AristoCraft "Classics" (Delton) to represent 36" US Narrow Gauge prototypes. See 1:24. LS/29 - 1:29 trains on 45mm track. Used primarily for US Standard Gauge mainline prototypes. See 1:29. Maerklin - A German manufacturer of high-quality 1:32 German Standard Gauge equipment. Maerklin also manufactures a line of American-style tinplate trains which resemble 1:32 in overall dimensions..
Mikado - A freight locomotive with two pilot wheels, eight drivers, and two trailing wheels. The first locomotives of this arrangement were sold to Japan, which explains the funny name. Mikado locomotives had replaced Consolidations on many routes by 1920, and they were used by most major railroads until the end of the steam age. So lots of model railroaders feel justified using Mikados to represent about any North American railroad between, say 1915 and 1960. The most popular Mikados were the USRA "light" and "heavy" Mikados - which differed mostly in weight and capacity - and the Pennsylvania L1, which was closer to a "light" Mikado, but had a Belpaire firebox that gave the locomotive a "square-shouldered" look. The LGB Mikado favors the USRA light Mikado, with a graceful look, compared to the AristoCraft Mikado, which favors the USRA heavy Mikado, and looks like it can haul (which it can). Mn2 - An NMRA proposed term for 1:13.7 trains on 45mm track. Not commonly used. See 1:13.7. Model Die Casting (MDC/Roundhouse) - A model train manufacturer who makes a few injection molded 1:32 Standard Gauge freight cars, a 1:24 caboose, and a small diesel locomotive. Model Railroader - While some people would assert that "all Large Scalers are Model Railroaders," I think that it is important to draw some distinction. In other scales, a "Model Railroader" is a person who attempts to build a model of a railroad (or a portion of a railroad). They typically expect their equipment and accessories to be in proportion and to reflect approximately the same period and geography. In addition, they attempt to create a realistic setting, including industries that allow for realistic operations. Since the advent of realistic-looking US prototype Large Scale trains, a higher proportion of Large Scalers (at least in the US) are beginning to fit this profile. This includes indoor and outdoor railroads. Unlike "Fine Scalers," most Model Railroaders tend to focus on an overall realistic effect, so some of them may be more interested in whether a model "fits" in their setting than whether some relatively unnoticeable detail is exactly right. On the other hand, many Model Railroaders make minor modifications to all or most of their equipment, such as replacing the couplers and wheels, or lowering the bolsters of their first-generation AristoCraft equipment to get a more realistic look. It's also common for Model Railroaders who have reached a point where they're fairly satisfied with their railroad, or who are driven inside by the weather, to take up Kit-Bashing and Fine-Scale as well. Model Railroaders in Large Scale have historically been forced to compromise to fulfill their overall dream, such as using slightly off-scale equipment or "borrowing" locomotives that didn't actually run on the line they're modeling. However, with new products entering the marketplace monthly, less compromise may be necessary in the future. In contrast with Collectors, Model Railroaders don't regard a new "paint job" on a previously-existing product shell as a "new model." From a Collector's point of view, Model Railroaders may show a shocking disregard for the potential collector's value of some rare item, by running it in the rain, or worse yet, approaching it with a can of spray paint or a razor saw. AristoCraft, Bachmann, and USA Trains attempt to cater to Model Railroaders (not collectors) by focusing on equipment that can be credibly labeled for a variety of railroads, and by releasing most products in a variety of road names to save Model Railroaders even the hassle of repainting their products. Mogul - A general-purpose steam locomotive with a 2-6-0 wheel arrangement (one pair of pilot wheels and three pairs of drivers). LGB's 1:22.5 mogul is the flagship of their US-prototype line. It is prominent on many mature Garden Railroads, in both wood-burner and coal-burner styles. Bachmann has released a 1:20.3 19th-century Mogul as part of their 1:20.3 line. MTH (AKA Mikes Train House) - A few decades back, Lionel's owners became content to sell cheap O gauge train sets at Christmas and to sell new paint versions of old products to collectors the rest of the year. Convinced that there were still many O-gaugers who actually wanted to run trains (and not just collect), a new manufacturer emerged who focused on providing what the customers actually wanted. MTH trains soon found their way to many O-gauge railroads, and began edging shopworn Lionel products off the shelves of many hobby shops. Now MTH has entered Large Scale with a series of products that they hope will give AristoCraft and USA Trains a run for their money. Unlike AristoCraft and USA Trains, MTH "RailKing" Large Scale products are about 1:32 in scale, the "correct" scale for Standard Gauge trains running on 45mm track. This makes MTH trains slightly smaller, but MTH has "made up" for that by offering models of several very large locomotives that visually compete with most 1:29 cars. Narrow Gauge - In the "real world," a Narrow Gauge railroad is one that runs on rails less than 56.5" apart ("Standard Gauge"). Unlike "Indoor scales" like O and HO, Large Scale has a "disproportionately" high amount of narrow gauge equipment. Unfortunately, in Large Scale, this Narrow Gauge equipment runs on the same track as the Large Scale Standard Gauge trains. You can't really blame the Narrow Gaugers; they were here first. But the problem is there, nevertheless. Yes, Narrow Gauge and Standard Gauge models will hook together if you put the same couplers on both of them, but they won't always look right together. In the "real world," Narrow Gauge railroads tend to use shorter trains, tighter curves, steeper grades, etc., than Standard Gauge railroads. In addition, many Narrow Gauge railroads ran a "mishmosh" of home-brewed equipment and kept their steam engines long after the Standard Gauge railroads had gone over to diesel-electric. Although early LGB users bought into Narrow Gauge because there was nothing else available, new Garden Railroaders still often choose to model Narrow Gauge railroads for their picturesque qualities and the ability to fit a credible railroad into a smaller space. Large Scalers who operate Narrow Gauge railroads tend to use scales like 1:22.5 (from LGB's original meter-gauge models), 1:20.3 (for modeling 36" scale railroads), or 1:24 (for modeling 42"-scale railroads). Use them to "trashbash" into accessories such as freight-yard offices or hobo villages. NMRA - The National Model Railroad Association, a world-wide society of model railroaders that promotes model railroading by hosting train shows, defining standards, etc. The NMRA has been very successful defining standards in the smaller gauges. Unfortunately, Garden Railroading's growth seems to have caught them by surprise, and there were a number of "de facto" standards in the marketplace before NMRA could react effectively. Consequently, many of the standards that NMRA have proposed for various segments of Large Scale define things that "ought to be" rather than things have become established practice. Staunch NMRA supporters who've migrated to Large Scale from the smaller scales seem to think it's only a matter of time before the rest of the Large Scale world comes around, however. In the meantime, many NMRA chapters are making an effort to incorporate Large Scalers into their shows and activities. But if you tell another Large Scaler (or even a hobby shop owner or NMRA member) that you model A, Mn2, or Fn3, be prepared to explain what you mean in numerical terms. Pacific - A passenger locomotive with four pilot wheels, six drivers, and two trailing wheels. This design replaced the Atlantic (which had four drivers) on most lines by the mid-1920s. It was favored by the Pennsylvania Rail Road and by railroads that liked USRA locomotive designs. Pacifics were used by most US railroads until the age of steam. For many years, the AristoCraft Pacific was the largest North American steam locomotive that was being mass-produced for garden railroaders. That model favors the USRA "heavy" Pacific, with a bulky appearance, and the newly reengineered version has the power to match. At the moment no one is manufacturing another popular Pacific, the Pennsylvania K-4. That locomotive was similar in many proportions to the USRA "light" Pacific, but which has a Belpaire firebox that gives the locomotive a "square-shouldered" look. Procumbens Juniper - A family of short-needled, low-growing Junipers that are excellent for groundcover in a place where they won't be disturbed too often. Includes Japanese Garden Juniper and Dwarf Procumbens Juniper. See the Family Garden Trains article Groundcover 101 for more information on groundcovers. You can use the word "Prototype" to complain about how few different kinds of models are currently available in Large Scale. For example "I wish more Pennsy prototype were available," means that you wish that some manufacturer would get off their duff and build you a K-4 you can afford. Note that neither use of the word "Prototype" reflects the most typical manufacturing use of the term: a "pilot" or "test" version of the product that precedes the production run. In a gathering of Model Railroaders, if you show a test version of a product and say, "This is only a prototype," you may draw some blank stares. Radius - Half the diameter of a circle. In "indoor" scales this is often used to describe how tight a curve is. If an HO modeller tells you he is using 18" curves, he probably means 18" radius-curves, or 36" diameter. This means that his heavyweight coaches will navigate the curves but will look silly. Unfortunately, in Large Scale, the term Radius is seldom used, as most manufacturers describe their track in terms of how big a circle it makes (diameter). When a Large-Scaler tells you he is using 5-foot curves, he may be saying he is using LGB 1500-style track, which makes a 60" circle. This means that his shorty coaches look bad and your heavyweights wouldn't even sit on the track. If he really means he's using 5'-radius track, he'll probably use the phrase "10'-diameter" instead. This has confused lots of folks who've come up from the smaller scales. Sometimes, out of habit, they say "radius" when they mean diameter. A fellow recently told me he used only 20'-radius curves on his railroad. I figured out what he meant when he added that his railroad was about 25x30'. The lesson here is, don't assume folks are talking radii when they brag about their railroads using nothing but "ten-foot curves." Rivet-Counter - In model railroading, the term "rivet-counter" is often used in a derisive sense to describe someone whom the speaker thinks is overly concerned with details that "normal people" wouldn't notice. The speaker's assumption is that most Large Scalers don't count rivets, and that may be true from a historical perspective, at least. Because of uneven manufacturer support and a plethora of "compromise scales," Large Scalers/Garden Railroaders have historically been forced to make compromises to achieve their overall goals. This was especially true early in the hobby, when almost everything that was commercially available looked like toys to North American eyes (see "Ten-Foot Rule"). If someone tells me I've made too many compromises, I can get back at him by calling him a rivet-counter. For example, if someone asks me why I don't run my daughter's Rio Grande reefer in my PRR consist, I can say, "Well, besides the differences in overall size, the rungs on the ladders would be way too far apart, the boards would be way too wide, the brake wheel is in the wrong place, and no car in those colors ever ran on standard gauge track." The appropriate response to such a statement is, "What are you, a rivet counter?" There are Large Scalers who pay much more attention to such details than I do, but the proper term for them is "Fine Scaler." Scale - In modeling, "scale" refers to the relationship between a model and the real world. For example, most dollhouses use one inch to represent a foot, so the items are 1/12th the size of the real thing. To put the scale into mathemetical terms, we express it as a ratio thus: 1:12. Most equipment made for garden railroads falls between 1:13 and 1:32 scales. Unfortunately, most of that equipment is actually running on 45mm track, which makes things interesting. You can walk into many hobby stores today and buy a 1:29-scale boxcar, a 1:22.5-scale caboose, and a 1:20.3-scale locomotive, and they'll all run on the same track. However they might look a little goofy together. For the most part, the better manufacturers are now printing the scale on their packages and in their catalogs, so look for that when you're making choices. The Family Garden Trains article "Which Scale Should I Model?" will give you additional pointers. Sectional Track - A term used in the "indoor" scales to describe a "family" of track products with preformed curves. Most "sectional-track" uses curves that turn 30 degrees, so 12 of them make a circle. They also have a standard-length straight piece that is designed to interact a certain way with the curves in ovals, figure eights, etc. This convention provides a level of comfort for people who are coming into Garden Railroading from "indoor" or "tinplate" scales. However, with most Large Scale curves, you can't exactly do a direct piece-for-piece replacement of, say, an HO-gauge track plan. Sedum - A family of succulent perennials that nicely represents bushes and small trees. Popular Garden Railroad sedums include "Blue Spruce," "Stubby Fingers," and "Acre." See the Family Garden Trains article Groundcover 101 for more information on groundcovers. Shay - Shay locomotives were gear-driven steam engines that were popular with logging and mining companies because they had a great deal of pulling power. The Bachmann Shay was one of the first high-quality locomotives that was mass-produced in 1:20.3 scale, the "correct" scale for modeling most US narrow-gauge trains on 45mm track. Although Bachmann's first Shay is no longer manufactured, they are still available from some dealers. In addition, Bachmann has released another model. SM-32 - 1:19.1 scale on 32mm gauge track, representing 2' gauge prototypes. A popular scale/gauge combination in the UK, especially with Live Steamers and other outdoor railroaders. Stainz - A diminutive 1:22.5 Austrian Narrow-Gauge locomotive with an 0-4-0 wheel arrangement, that went into most LGB Starter Sets for years. The Stainz' profile is featured in the LGB logo. Standard Gauge - In the "real world," Standard Gauge trains run on track with rails 56.5" apart (a measurement left over from Roman military chariots). Most North American trains, and many trains on other continents use this gauge. In addition, most Model Railroaders in most scales model Standard Gauge railroads. When people modeling in O, S, HO, or N scale want to model a Narrow Gauge railroad, they use tracks that are actually narrower than the tracks they are using for their O, S, HO, or N-gauge trains. Unfortunately, in Large Scale, manufacturers have chosen to make Standard Gauge and Narrow Gauge equipment that all runs on the same 45mm track. This has caused no end of confusion. 1:29 (a very well-supported "compromise scale" introduced by AristoCraft and picked up by USA Trains). Note: In the early 20th century, there was a line of "tinplate" trains running on 2 1/8", three-rail track that was also called "Standard Gauge." We could completely ignore them, except for one historical quirk. Nat Polk, the patriarch of the family that runs AristoCraft, loved the old Standard Gauge tinplate trains so much that when the Polks started building their own Garden Railroad equipment, they "borrowed" the 1:29 scale from the old trains and transplanted it onto 45mm track. If the models the Polks eventually got around to building hadn't been so attractive and sturdy, 1:29 might have died of natural causes. Instead, the Polks keep improving and expanding the AristoCraft line, and USA Trains have followed in their tracks. Consequently, people from all over (including smaller scales) have fallen prey to the "Gee Whiz" syndrome and started their own 1:29 railroads, to the dismay of a small, but vocal minority who insists that none of us are "doing it right." Until 2001, 1:32 didn't have enough quality products consistently offered to make it a viable scale for modeling mainline railroads. In 2001-2002, MTH, an O-gauge manufacturer, entered the Large Scale fray with a line of reasonably-priced 1:32 locomotives. Since then MTH has added many cars. My guess is that, even though MTH has made a grand entry, with several attractive pieces, it will take them many years to "catch up" to 1:29's quality and variety, after which 1:32 will coexist alongside 1:29 for another couple of decades at least. Had MTH entered the hobby four or five years earlier, while Aristo was the only significant 1:29 supplier, or before the top-notch second-generation 1:29 stuff came out, the effect might have been more profound. Starter Set - A pre-packaged set of train equipment, usually including a circle of track, a locomotive, a power pack, and two or three cars. This is often a nice way to introduce someone to Large Scale, with the caveat that the little circle of track should stay inside with the Christmas decorations--some of it won't even survive outdoors, and all of it uses a ridiculously tight "toy-like" radius. Switch - An electrical device for connecting or disconnecting a circuit. If you expected another description, see "Turnout." Ten-Foot Rule - Nobody actually has rulers that are ten feet long. When people say they follow the "ten-foot rule," they mean that they're more concerned with the overall effect of trains running in their back yards than they are with details you would only notice close up. Many folks who cite the ten-foot-rule started in Garden Railroading when there were few manufacturers and products, and you had to make serious compromises (or build everything yourself) to get anything that looked remotely like a railroad operating in your back yard. Invoking the ten-foot-rule meant "I'm doing the best I can with what I could find, and I'm having a lot of fun doing it; if you think it looks funny, take a few steps back. Preferably toward the cliff." Now that more variety and quality is available, fewer people invoke the ten-foot rule for fewer compromises. In fact, most of the people who invoke the rule today could get by with a five-foot rule instead. Ten-Wheeler - A general-purpose steam locomotive with a 4-6-0 wheel arrangement (a four-wheel pilot truck and three driver pairs). Bachmann's inexpensive, but attractive Ten-Wheeler was their first and most successful 1:22.5 locomotive; it was so successful it has been reengineered three times and is available in wood-burning and coal-burning versions. Thyme - A low-growing herb that not only smells good but provides excellent ground-cover. The low-growing thymes like Woolly Thyme and various Creeping Thymes are favorites with Garden Railroaders, although they're not as hardy as "common thyme" (Thymus Vulgaris), which can get too tall for some uses. See the Family Garden Trains article Groundcover 101 for more information on groundcovers. Tinplate - Most of the earliest electric toy trains were made of stamped sheet steel that was tinplated, painted, or lithographed. In the very early days of model railroading, when no one was mass-producing scale models, and modelers were building things out of balsa wood, cardboard, and brass, the word "tinplate" came to represent, not only trains made out of tinplated metal, but anything produced by the "traditional" toy train manufacturers (at that time, Ives, Lionel, and American Flyer). That designation "stuck," even when trains started being made out of plastic, and when American Flyer began building models that were scale in everything but flange height and coupler size. People justified calling plastic toy trains "tinplate" because the track is still made out of tin-plated sheet metal. Nowadays when someone uses the term "tinplate," they usually mean anything that's more toy than model, especially if it is manufactured by Lionel or American Flyer. (For some reason, LGB products that are obviously more toy than model don't get this designation.) People who use models (like postwar AF) which are essentially scale models except for flange height and coupler size prefer the term "Hi-Railers," to distinguish themselves from folks who'll run any old thing. Trainscaping - I use the term to describe the kind of landscaping and gardening work you do to provide an appropriate, attractive setting for your trains. For more on this, as well as a few other definitions of the word, check out Trainscaping.com. Train Set - See "Starter Set." Whatever you do don't stand next to a well-established garden railroad with dozens of buildings, hundreds of feet of track and multiple trains running and say "Oh, what a nice train set." Trash-Bashing - Reworking something that isn't a model at all into a scale model. 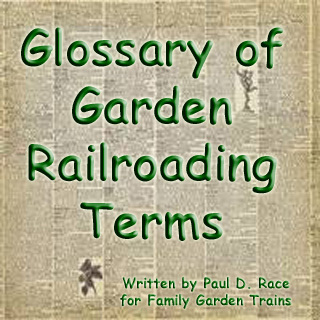 Paul Race coined this term to describe what Garden Railroaders have done with bird feeders, Fischer-Price buildings, and other cast-offs or flea-market purchases. Many Garden Railroaders became "trash-bashers" in the days when accessories that looked "right" on US-prototype railroads were few and expensive. A few have developed such a taste for "doing more with less" that they now do for fun what they once did out of necessity. The Family Garden Trains article "Building a Garden Railroad on a Budget" provides additional examples. Turnouts - Turnouts are track formations that allow trains to move from one path to another, such as from a mainline to a siding. Lots of folks call these "switches," but in Model Railroading, we often try to use the word "switch" to describe electrical switches, to avoid confusion. Just remember: you can get Switches at Radio Shack, but you have to go to a hobby shop to buy Turnouts. On the other hand, lots of folks still aren't up-to-speed on this term, so if you see blank faces when you use "Turnout" in a conversation, you may have to explain what you mean. USA Trains - The Large Scale offerings of Charles Ro's hobby enterprise. Though Ro started out making 1:22.5 Narrow Gauge cars that "looked right" with LGB's US cars, his motive power and all of his most recent offerings are about 1:29, making them more compatible with AristoCraft. USRA - The United States Railroad Administration was formed early in World War I to "fix" a wide range of problems that had kept American railroads from serving the country effectively during the early months of the war. One of the longest-lasting results of USRA administration was a new series of locomotives designed to use as many common parts as necessary, to reduce maintenance headaches. The USRA designs were probably influenced a great deal by Pennsylvania Rail Road planners, who were already building locomotives with interchangeable parts. One result is that several USRA locomotives, including the Mikados and Pacifics closely resembled locomotives that were under development by PRR at the time. However, USRA designers chose to stick with the round "radial stay" fireboxes rather than to use the Belpaire fireboxes that gave so many PRR locomotives a "square-shouldered" look. The USRA locomotives designs were so successful that USRA locomotives were used by most American railroads until the end of the age of steam. For this reason, many model railroad manufacturers make versions of the most common USRA locomotives, such as the the Mikado and the Pacific. In fact, AristoCraft's Pacific and Mikado mimic the real thing by sharing the same cab, boiler, and many details. Wide-Radius - Curves that are wider than LGB 1600, which make a circle about 8' in diameter. AristoCraft now has track formats that make circles 10' and 20' in diameter. AristoCraft also has "wide radius" turnouts which are wider-radius than the LGB 1605 and 1610 turnouts, although they are still very "tight" turns by "indoor" Model Railroad standards. Unlike LGB 1605 and 1610 turnouts, AristoCraft's "Wide Radius" turnouts do not directly replace any kind of curve, so if you use the curved path of the turnout to replace a curved piece on a loop (not a good practice anyway), you will have to do some other accommodations to get things to match up. LGB has recently announced plans to make wide-radius curves and turnouts as well, including 15'-diameter curves. 1:1 - (Pronounced "one-to-one") Full-sized. This is used in sentences such as "The one-to-one raccoons are knocking over my one-to-thirty-two buildings." 1100 - A kind of LGB curved track, also called R1. Twelve of them make a circle that is about 48" in diameter. This is the tightest curve commercially available in Large Scale, and only very short cars and engines (such as switchers and ore cars) look "right" on it. However, LGB has made a commitment to their users that they will never build a locomotive that will not run on 1100 curves. Consequently, LGB has made some strange accommodations to get larger locomotives like Mallets and Hudsons to navigate these circles. The first generation of AristoCraft, USA Trains, Bachmann, and Lionel products also nominally fit this "requirement," though some of the longer, US-style equipment looked pretty silly. Nowadays, there are quite a few non-LGB pieces which will not even navigate 1100 (or 1500 curves), and most people reserve the 1100 track that came with their starter sets for use indoors at the holidays; they buy wider-radius track for use in their permanent installations. 1:13.7 - The scale you wind up modeling (more or less) in if you use 45mm track (1.775") to represent a two-foot-gauge railroad. (Divide 24" by 1.775"). Also called 7/8" - scale. The NMRA calls this scale/gauge combination Mn2, but almost nobody else does. 1200 - A kind of LGB straight track, about a foot long. 1205 and 1210 are LGB turnouts that are about a foot long on the straight path. The curved path of a 1205 or 1210 turnout is a direct replacement for an 1100 curve, which has tempted more than one person to put the curved path of a turnout on a mainline loop. (This is not generally a good practice, as centrifugual force can encourage trains to try to take the straight path even if the turnout is set the other way.). 1:20.3 - The scale you are modeling in (more or less) if you use 45mm (1.775") track to represent a 36"-gauge railroad. (Divide 36" by 1.775.") Note: Most of the 1:22.5 and 1:24 US-style Large Scale equipment is also meant to represent 36"-gauge equipment, but it's slightly "undersized." A few high-quality pieces of 1:20.3 equipment are commercially available, and the manufacturers promise more on the way. The NMRA calls this scale/gauge combination Fn3, but almost nobody else does. 1:22.5 - The scale you are modeling in (more or less) if you use 45mm track to represent a Meter-gauge railroad. (Divide 1000mm by 45mm and you get the general idea.) When LGB began making models of US prototype equipment, they kept the same scale instead of using 1:20.3, the "right" scale for modeling 36"-gauge on 45mm track. Bachmann followed suit, as did the first-generation USA Trains rolling stock. Today, most mature Garden Railroads modeling US narrow gauge prototype (such as Rio Grande) use most or all 1:22.5 equipment. Also called G Scale. 1:24 - The scale you are modeling in if you use 1.775" track to represent a 3.5' railroad. (Divide 42" by 1.775") Although most US dollhouses are 1:12, 1:24 is a "secondary" dollhouse scale with lots of accessories, one of the reasons that Delton Locomotive Works adopted 1:24 for their trains back in the "early days" of the modern Garden Railroading movement. Delton is no longer in business, but many of its molds live on in the hands of companies like AristoCraft, who markets them as their "Classics" line. Most of Hartland Locomotive Works equipment is also about 1:24. Lionel's Large Scale equipment tends to be about 1:24 in height and 1:32 in length, so some of the pieces can be used on a 1:24 railroad as well. NMRA calls this scale "Hn3.5," but almost no one else does. 1:29 - If Tinplate trains ever had a scale, 1:29 would be considered the approximate scale of the old "Standard Gauge" stamped-metal trains that ran on three-rail track approximately two inches across. 1:29 would have died of natural causes when the last Ives train rusted to pieces, if Nat Polk, patriarch of the family that owns AristoCraft trains hadn't been so enamoured of the scale. When the Polks decided to build their own US-prototype Garden Railroad equipment, Nat saw it as an opportunity to revive the old scale. So they built their trains in 1:29 instead of 1:32, the "proper" scale for modeling real-world standard-gauge railroads on 45mm track. As of February, 2001, there are many high-quality 1:29 models available and many more on the way, while 1:32 still has relatively little support. The high quality of today's AristoCraft and USA Trains' 1:29 equipment has certainly attracted many people into the hobby, including many hobbyists from smaller gauges. And there is no question that 1:29 stuff looks more impressive than 1:32 stuff when they are sitting next to each other. So 1:29 probably has a fine future, even if 1:32 eventually offers enough products to make it a viable alternative. Sadly, 1:29 has a glaring lack of accessories--even the buildings sold by AristoCraft are closer to 1:24. 1:32 - This is the appropriate scale for modeling standard-gauge railroads on 45mm track. (Divide 56.5" by 1.775"). In spite of all the good that the Polks have done for Garden Railroading and Large Scale, some of their strongest supporters still can't help wishing they had chosen 1:32 for their trains instead of 1:29. It would have saved a great deal of confusion and even some heated arguments. So far, 1:32 "manufacturer support" has been largely characterized by manufacturers who came in and out of the market with toylike products, and a few very nice (and expensive) custom pieces. MTH changed that in 2002-2004 with the introduction of three 1:32 locomotives and several cars. Like 1:29, there is a sad lack of buildings and accessories for 1:32, although the resin Lemax figures made for holiday villages are useful. 1500 - A kind of LGB curved track. Twelve of them make a circle that is about 5' in diameter. LGB introduced this track radius because people wanted to be able to easily design parallel tracks with concentric curves. (They use 1100 curves on the inside and 1500 curves on the outside.) Trains look better and run better on 5'-diameter track than they do on 4'- diameter track, so if you don't have room for anything larger, this is still better than using 1100. If you're clever, you can also use 1500 track to create "easements" into 1100 curves, since each piece of 1500 track "curves" the same amount (30 degrees) as each piece of 1100 track. If you're mixing and matching track radii, you should realize that each piece of 1600 track curves only 22.5 degrees, so using 1600 curves in the same loop as, say, 1500 curves can get interesting. Many Garden Railroaders who are just now getting into the hobby prefer AristoCraft's 10-foot diameter track pieces. Not only are the curves broader, allowing better appearance and operation, but 12 make a circle, so people used to sectional track have an easier time planning a layout with them.